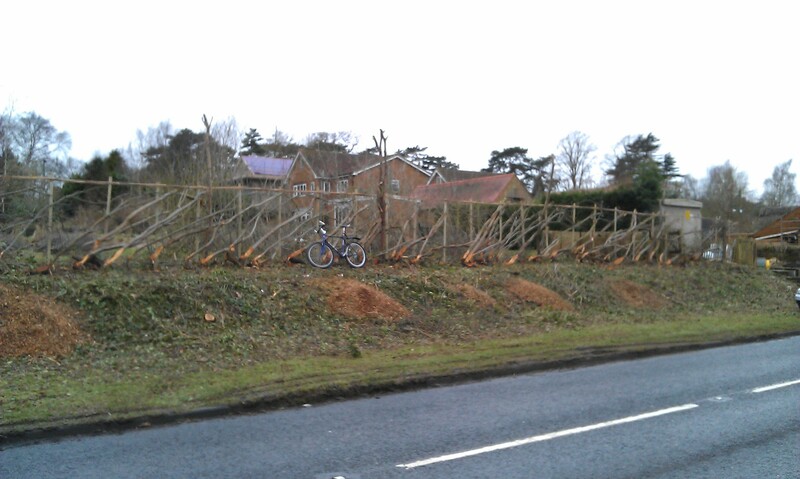 You may remember that I noted earlier this month an impromptu lecture by John Cutler on the subject of hedge laying (when we were riding home from New Year’s Lunch at the Sibbertoft Reading Room. And it’s hedge laying, not “layering”. Well, John has shown he is not just an authority on hedges but a skilled craftsman. I was out cycling this morning and stopped to admire the hedge that he is laying at the boundary of his property in the village of Chapel Brampton. This is impressive! This entry was posted in Uncategorized and tagged Chapel Brampton by ianmac55. Bookmark the permalink.